Sunday was a beautiful day, so before going for a walk I went into the living room to set the TV recorder for The Politics Show: sometimes the local bit of it can make undemanding viewing on a lazy Sunday afternoon. So I’m about to hit the Sky+ button when Alasdair McDonnell appears on the screen, talking. I forget about recording and take a seat. You’re familiar with the term “car-crash TV”? The present Mrs Collins hid behind the sofa, a cushion pressed to her face and moaning softly; the cat ran three times round the room, clawed up a curtain and shot out a half-open window; I sat gripping my seat, wanting to look away but unable to do so, softly repeating the name of my Saviour over and over. Why did it happen? Why did Dr Alasdair McDonnell, Raging Bull to Maggie Ritchie’s Tetchy Librarian – why did he let slip his golden moment? Some people have compared the speech to Brian Cowen’s the-morning-after-the-night-before interview, but it was never that. McDonnell sounded tired, yes, but not in a ‘bin-partyin’-all-night’ way. The comparison which his performance came nearest to was Sean Gallagher’s a few weeks back. Comparable but not the same. True, both men were holed below the waterline as tens of thousands watched agog, but whereas Gallagher was torpedoed by Martin McGuinness’s questioning, McDonnell got torpedoed by a set of lights. Mind you, lights can be tricky. At the Omagh rally for Martin McGuinness two months back, I found myself, not blinded, but faced with an inky blur where there should have been 500 people. Scary. But you stiffen the sinews, gird the loins and get on with it. Not so McDonnell. He stopped in mid-sentence, not once but several times, less like Gallagher and more like an old-style parish priest rounding on his half-wit parishioners. “Switch off those lights, would you? Jeez, I’m blinded”. So the lighting affected his autocue: but where was Plan B? Everyone knows technology will try to bite your arm off when you’re most dependent on it. So the lights fouled up his autocue – then where were his old-fashioned notes? No sign. Instead, the close-up camera showed Alasdair’s tongue and mouth shaping another comment, only to dart off at the last minute in another direction. Awful. Shades of Gallagher and his wobbly “I didn’t/I did/I may have collected an envelope”. Shades too of Neil Kinnock’s “We’re alllll riiiiiight!” speech shortly before being obliterated at the polls. Ritual self-disembowelment on live television. And it wasn’t just the optics or the response that made viewers bite their knuckles. The speech’s content was a PR nightmare as well. The good doctor did what he could to turn his bull-in-a-china-shop reputation into something positive, but ended up promising that yes, he’d smash something, he’d smash the myth that the SDLP was dying – he was a doctor and this patient was not in terminal decline. Eh? Unbidden, the mind summons up images of that other doctor, Dr Paisley, with his sledge-hammer poised, beneath the poster promise to “Smash Sinn Fein!”. And we know where that promise went. 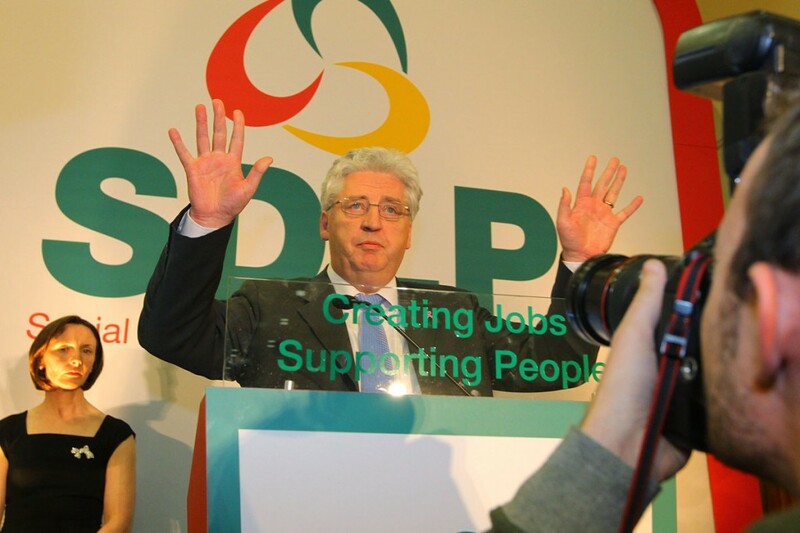 The SDLP Big Man’s speech stuttered on with talk of closing dead SDLP branches, organising committees and team-leadership, and the only thing wrong with this party is it doesn’t get enough votes. Some commentators are saying – and on Monday Alasdair was saying – sure it’s the past, and it’s years until elections, by then the speech will have been forgotten. Uh-uh. Alasdair and his victory speech are now, I’m afraid, inextricably linked. You don’t forget unforgettable television. Still, chin up. Who would have predicted Sean Gallagher’s sudden rise and even more-sudden fall? Or a couple of years back, who would have predicted Fianna Fail’s obliteration? So who’s to say that Dr McDonnell won’t indeed spread his manly medical frame over the body of the SDLP and breathe new, vigorous, smashing-everything-in-sight life into it? On the other hand, there’s that old saying “Start as you mean to continue”, and if that’s the case, let me put my arms around those who love the SDLP and murmur gently “You have my deepest sympathies”.